Would you like to learn how to identify the bees that visit your garden or local park? Would you like to count how many of each species you see, and help Friends of the Earth find out which are doing well and which are endangered? Friends of the Earth’s Great British Bee Count starts this Thursday, 17 May, and runs until the very end of June. This gives you over six weeks to learn and put into practice your bee-spotting skills! There is a free app to help you identify the species (look out for stripes and the colour of the tail) and record how many you’ve seen. There are solitary bees as well as bumblebees, and they come in a variety of sizes – they don’t all have the classic ‘queen bumblebee’ shape. If you sign up, you’ll also get a handy bee-friendly plant guide, and tips for creating pollinator habitats. 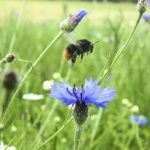 The Great British Bee Count is supported by Buglife and sponsored by Ecotalk, a new mobile service powered by green energy, which uses your money to buy land to give back to nature. Sign up today and join more than 10,000 people nationwide who will be out there keeping track of our bees!